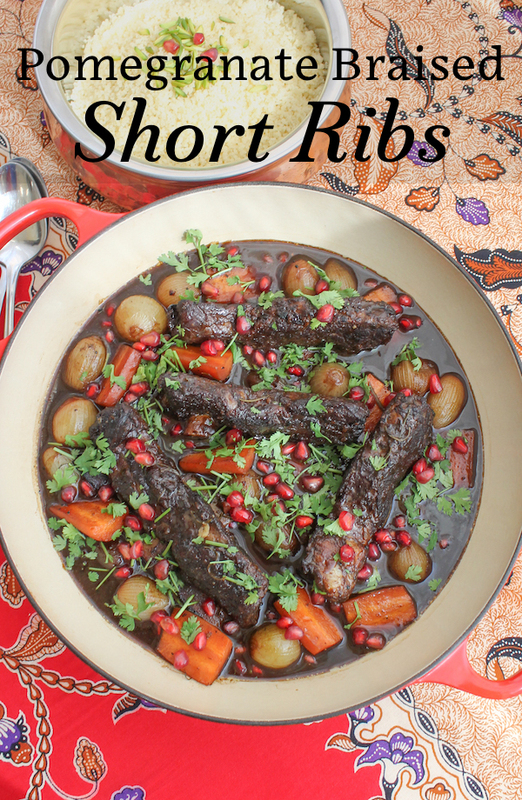 Pomegranate braised short ribs are tender and rich with the sweet and sour sharpness of the pomegranate molasses perfectly complementing the melt-in-your-mouth beef. You'll want to eat this sauce with a spoon! Pomegranate molasses is nothing more than pomegranate juice cooked down until it has reduced to the point of being thick and syrupy. If you can’t find any in your local grocery store, it’s easy enough to make at home. Some brands add sugar, which is not necessarily a bad thing if they don’t add too much, but you do want to make sure that the sweet doesn’t overpower the sour. Good pomegranate molasses should have a solid sour punch. 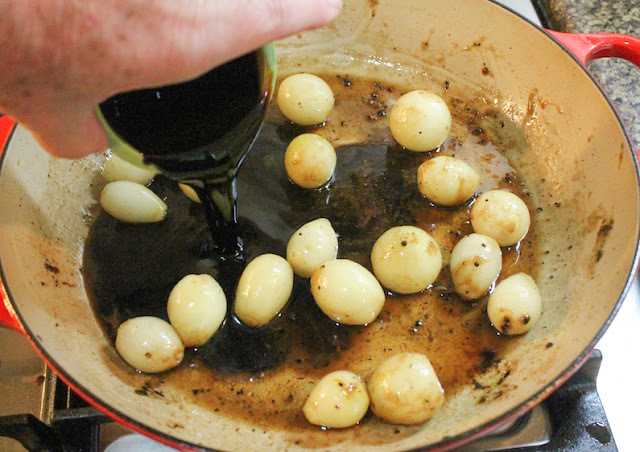 I must confess that although it seems ubiquitous in online recipes lately, I had never heard of pomegranate molasses until just a few years ago, when we moved to Egypt. They have a fabulous dish made with chicken livers, well seasoned with ground spices and quick fried till still pink inside. Just near the end of cooking time, pomegranate molasses is added to the hot pan. It dries up quickly in the high heat and coats the chicken livers with a sticky slick of sweet and sour. Divine. And now I’ve made myself hungry for those again! 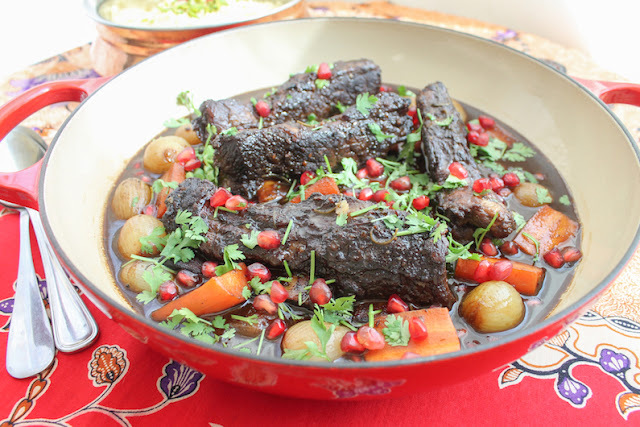 Unlike the chicken livers, pomegranate braised short ribs are cooked long and slow, in a lovely mixture of pomegranate molasses, beef stock and fresh rosemary. The succulent rib meat absorbs the flavors of the liquids and releases its own meaty juices into the resulting savory sauce. 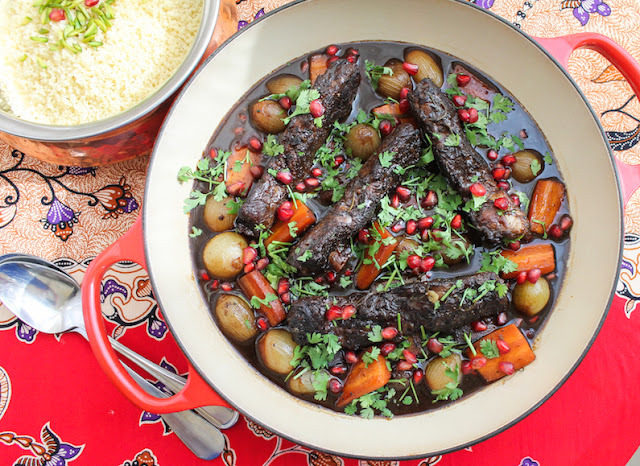 Serve this over a bed of fluffy couscous, sprinkled with extra pomegranate arils and some chopped cilantro for pop and a fresh bright finish. Couscous – check out my easy instructions here. 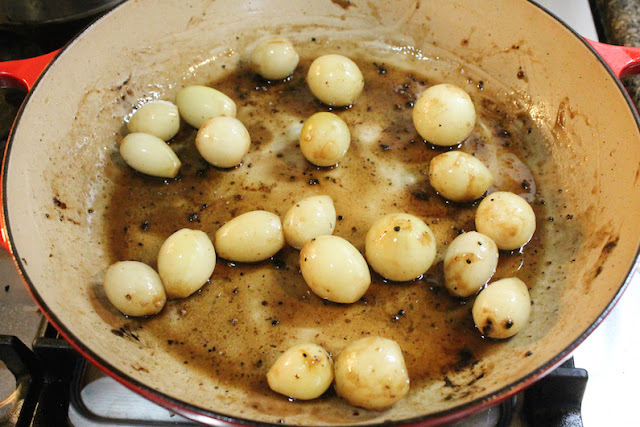 Tip: To peel small or pearl onions, bring a pot of water to the boil. Add the onions and boil for 1-2 minutes. Drain the pot and put the onions in a bowl of cold water and ice to stop the cooking process. Drain again. Cut the ends off of the onions with a sharp knife and squeeze them out of their skins. Remove the ribs from the pan. Add the peeled onions with a splash of the beef stock and sauté them for a minute or two, loosening up the sticky stuff on the pot from the ribs. Pour in the pomegranate molasses and stir. Put the ribs back in the pot and spoon the pomegranate molasses over them to coat. Tuck in the rosemary sprigs and pour in the rest of the beef stock. 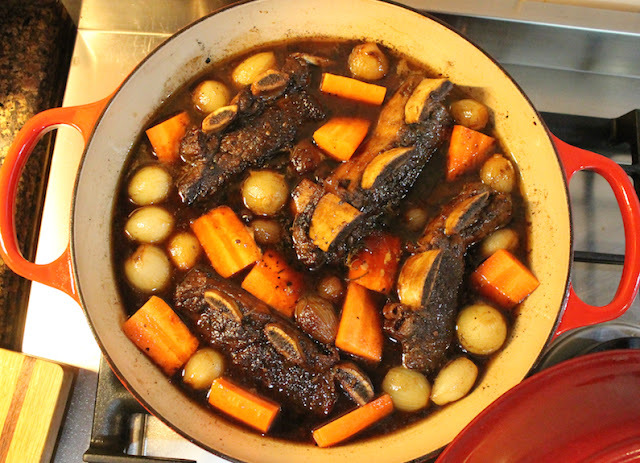 Cover the pot and simmer until the beef short ribs are tender, about 1 1/2 hours, check the liquid level occasionally, adding a little water if necessary. Baste the ribs with the sauce from time to time and turn them over halfway through. Add in the carrots and cook, covered until they are tender too, about 20 minutes. Remove the lid and cook the sauce down until it begins to thicken, spooning the sauce over the ribs occasionally. 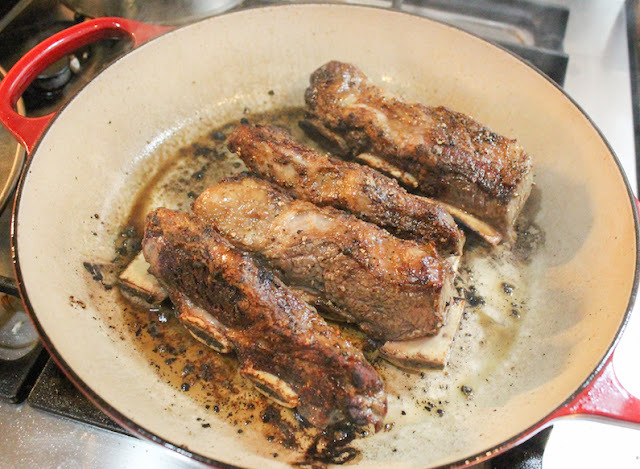 Depending on how fatty your short ribs were, you might need to skim some of the fat off of the top of your sauce. If you have time, in fact, you can even chill the dish at this point, making the fat easier to remove once it is cold. 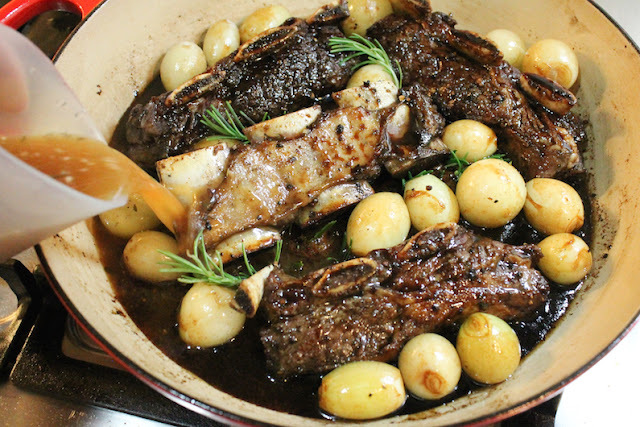 If you choose this option, gently rewarm the short ribs in the sauce and continue with the next step before serving. Garnish with chopped cilantro and pomegranate arils. Serve over couscous. This month my Foodie Extravaganza group is celebrating rib recipes. Many thanks to our host, Sneha from Sneha's Recipes for this great theme and all of the behinds-the-scenes work. Who doesn't love ribs, am I right? 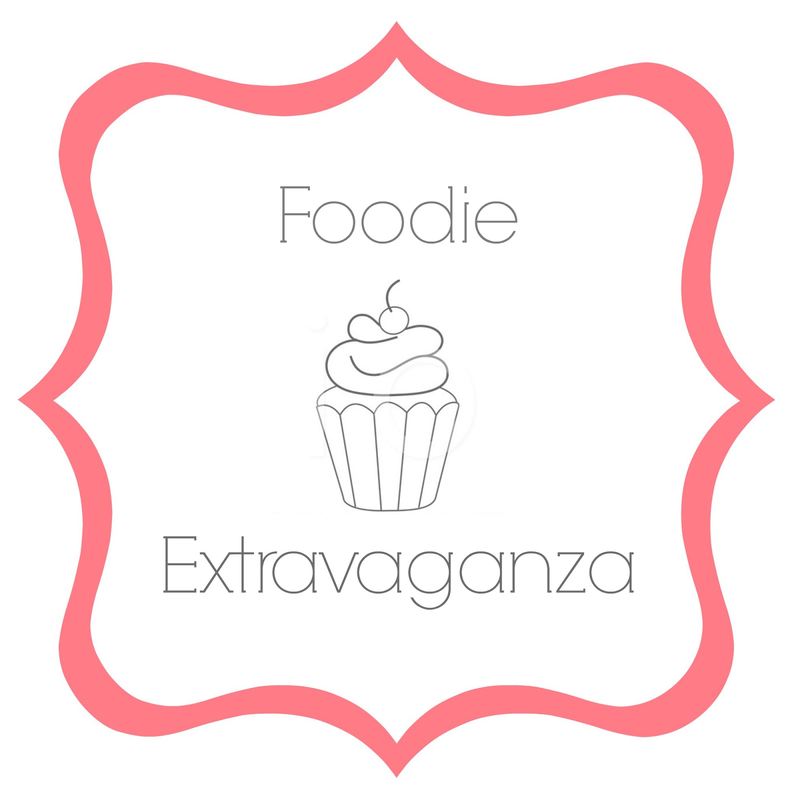 Foodie Extravaganza celebrates obscure food holidays or shares recipes with the same ingredient or theme every month. Posting day is always the first Wednesday of each month. 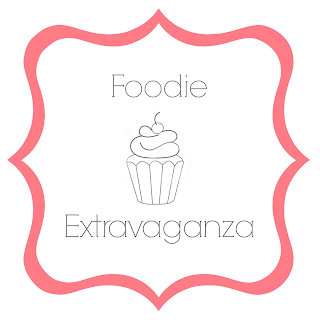 If you are a blogger and would like to join our group and blog along with us, come join our Facebook group Foodie Extravaganza. We would love to have you! If you're a reader looking for delicious recipes, check out our Foodie Extravaganza Pinterest Board!